The City of Sault Ste. 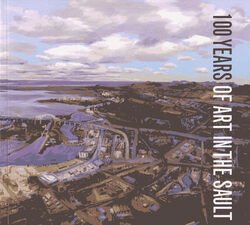 Marie Celebrates 100 years of incorporation in 2012, and 100 Years of Art in the Sault is a banner event for this year of celebrations. This exhibition and catalogue encompasSess historical landscape art from the area along with contemporary reflections. In his essay, Michael Burtch outlines the various interests of artists throughout the Sault's history and depicts the unique location of this community, on the banks of the St. Marys River and between Lake Superior and lake Huron. The contemporary component of this project includes several watercolours and two large-scale paintings of the city landscape by internationally renouned artist John Hartman. Mary Reid discusses in her essay how these paintings marked the city's anniversary with a permanent record and act as symbols of beauty, growth and sustainability for this community. Note: Image above is the painting by John Hartman and is the cover of the book. Article was written by Michael Burtch.